This PDF 1.5 document has been generated by Adobe Illustrator 9.0.1 / Adobe PDF library 4.800, and has been sent on pdf-archive.com on 25/04/2013 at 08:17, from IP address 210.184.x.x. The current document download page has been viewed 574 times. 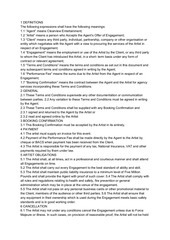 The Agent acknowledges receipt of the above instructions from the Customer. Carrier's Air Waybill or other such similar documents. 1. The Customer declares that all descriptions, values and other particulars furnished herein are accurate and complete. whatsoever arising from any inaccuracy or omission, even if such inaccuracy or omission is not due to any negligence. other reason cannot be delivered within a reasonable time. are to be prepaid or collected. the Customer and the Agent. the basis that the Agent will not accept any liability whatsoever therefor in tort or bailment or otherwise. any person. The Agent does not contract hereunder for the carriage of goods. Customers from Hong Kong to overseas destinations principally by means of air transportation. places designated by such air carriers. Warehousing or otherwise storing the goods before handling over the goods to the air carriers. by the consignees or other persons designated by the Customers or consignees and attending to such collections. Placing of insurance in respect of the goods. Otherwise handing of the goods pursuant related or incidental to the instructions of the Customers. The transportation of goods mentioned in (a) and (c) above will hereinafter be referred to as “local transportation” or “localcarriage”. Notwithstanding (iii) above the Agent is entitled to perform any or all of the ancillary services specified therein by itself. The Agent is not a professional haulier, carrier, packer, warehousemen, customs broker or insurance broker. 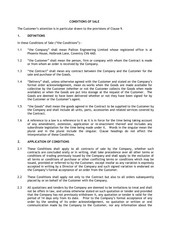 AUTHORITY TO CONTRACT FOR THE CUSTOMER ETC. transported to overseas destinations by means of transport other than air transport. commission or remuneration or profit. sole obligation is to procure contracts for the carriage (overseas or local), storage packing or otherwise handling of goods by other persons. limitation of the liability of such carriers. or it is otherwise expedient to do so. The provision relating to the Agent’s liability as set out in Condition 24 shall apply. and is not accountable to the Customer or the consignee or the owner therefor. 17. RIGHTS AGAINST THE CONSIGNEE ETC. under these Conditions not only against or from the Customer but also if it thinks fit against or from the consignee or the owner. WARRANTIES OF FITNESS OF GOODS ETC. the Agent is contracting hereunder as a carrier or otherwise as a principal. incurring pending collection will be for the account of the Customer or the consignee or the owner. the agent of the Customer or the owner and will be liable only in the event of wilful misconduct on the part of the Agent or its own servants. or otherwise as a principal. damage “includes but is not limited to goods likely to harbour or encourage vermin or other pests. The Agent is entitled but is not under any duty to inspect the goods or cause the goods to be inspected. enroute) for all sums due at any time from either the Customer or the consignee or the owner. or the consignee or the owner. liable to the Agent for any deficiency in the sale or disposal. The Agent right of particular or general lien will have priority over the Customer’s or the owner’s right, if any, of stoppage in transits. Customer or the consignee or the owner. supplies any information in respect of the goods, it does so as the agent of the Customer. not and shall not be constructed to be instructions to insure. shall be governed by the certificate or policy issued and will only be effective when accepted by the insurance companies or other underwriters. time the aircraft shall arrive at the airport at theoverseas destination, and the goods be there discharged and landed. such policy is available for inspection by the Customer upon request. rate as that charged by the Agent or paid to the Agent by the Customer or that the policy is in the name of the Agent or the Agent’s agent. liable to the Customer for making any claim against or notifying the insurer thereof on behalf of the Customer. WARRANTIES OF DESCRIPTIONS, VALUES ETC. by the Agent itself shall not be interpreted that the Agent is contracting hereunder as a carrier or otherwise as a principal. Estimates and quotations are given on the basis of immediate acceptance and are subject to withdrawals or revisions. changes occurring in currency exchange rates, rates of freight, insurance premiums or any charges applicable to the goods. hours after the discharge of the goods by the air carrier and notice of arrival has been communicated to the notify party whichever is earlier. documents relating thereto to be withheld until payment is made. Banking Corporation prevailing at the relevant time or times. Agent impossible to arrange for the delivery of the goods. freight charges, customs duties, taxes or any other charges in respect of the goods. THE AGENT’S PARENT, SUBSIDIARY OR ASSOCIATED COMPANIES ETC. 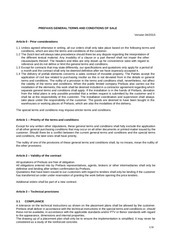 firm or company a liability greater than that accepted by the Agent under these Conditions. arising out of the negligence of the Customer. for consequential loss, or loss or profit, or delay, or deviation, or fire, or theft howsoever caused. owner, whether or not such mis-statement is due to any negligence. In any other case within  days of the event giving rise to the claim. pursuance of Condition 4, or against any of their respective servants or agents on any ground whatsoever. or otherwise) by which liability may be enforced. 11. DECLARATION OF NATURE VALUE ETC. necessary to comply with such laws and regulations. or the owner’s or the consignee’s failure to comply with this provision. any goods or as to any special interest in delivery, unless expressly instructed by the Customer in writing. accepted by the consignee for any reason. goods may be at the relevant time will be likely to perish. sum held in trust by the Agent but shall reimburse the Agent for all expenses incurred in holding such sum. whatsoever for or in connection with the goods howsoever caused. gender or feminine gender as the case may be. continuing default or right of a like or similar nature. or any such act or contract shall be within exclusive jurisdiction of the Hong Kong courts. Any property not set forth and described herein. Jewelers, plate trinkets, money and other valuables. Loss or damage by fire or burglary. invasion war or the act of God. Loss or damage arising form insufficient packing, wet, rot, rust damp, sweating, vermin moth or inherent vice or deterioration. said or any other property. removal and unless the loss or damage be proven to have taken while the property was in their store and or office. This file has been shared by a user of PDF Archive. Document ID: 00101816.